The Archbishop’s Palace at Southwell Minster is layered with over 1000 years of history. Events that took place here have formed the fabric of the nation and altered its course. Audio Trails were commissioned to design an interactive multimedia tour that provides a fascinating ‘Who’s who’ of the people that shaped the history of Archbishop’s Palace. It was here that Cardinal Wolsey spent the final months of his life at the Palace, trying to clear his name after failing to annul the first marriage of Henry VIII. King Charles I was brought to the State Chamber to complete the ‘paperwork’ of his final imprisonment. 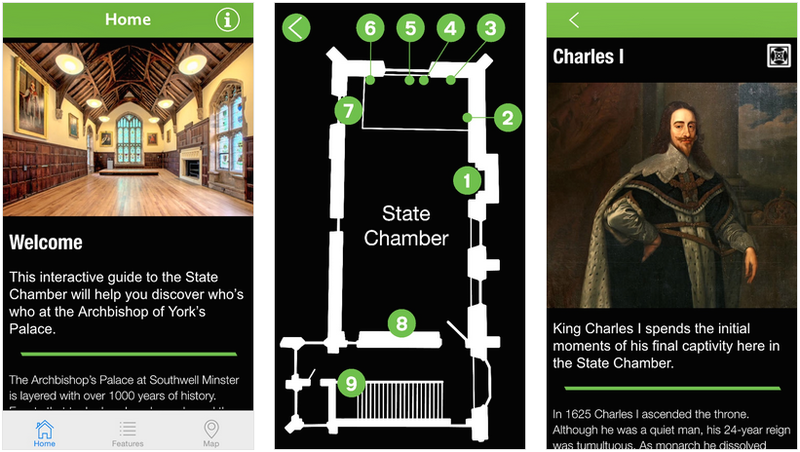 The State Chamber’s portraiture and artefacts are visual markers for the rich content contained within the beautiful iOS and Android apps.